No doubt, that this is the best combination that you can imagine in one design. Not only, does it have the known "Lions of Judah" from Genesis 49:9, that reflects bravery and strength. 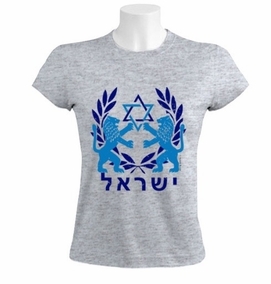 It also has the "Star of David", which reflects our Jewish identity and history. This design is a must purchase for any Israel supporter. Made from 100% Cotton T-Shirt, unique and hard to find. Our t-shirts are made of 100% cotton and are long lasting with bright colors. Our products are all designed and printed in Israel.